Uvulopalatopharyngoplasty (UPPP) is surgery to take out excess tissue from the back of the mouth and the throat. UPPP is most often done to treat sleep apnea . This causes pauses in breathing during sleep. Rarely, it may be done to treat severe snoring. Muscles in the back of your throat relax when you sleep. When the muscles relax, the soft tissue they support can collapse into the airway. The narrowed airway can cause snoring and sleep apnea. UPPP removes excess soft tissue to keep the airway open during sleep. It may be done if other treatments haven't worked. Some people don't respond to this surgery. Other methods to control sleep apnea may still be needed. This surgery is more successful in those who maintain a healthy weight. Don't eat or drink anything after midnight the night before. Talk to your doctor about the medicines you take. You may need to stop taking some medicines up to 1 week in advance. General anesthesia will be used. It will block pain and keep you asleep through the procedure. The doctor can gain access to the area through the mouth. Cuts will be made to take out excess tissue. 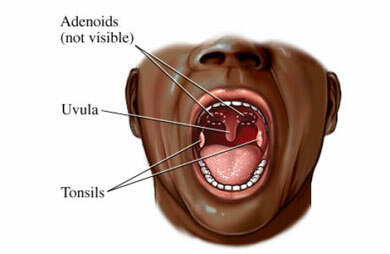 Your tonsils and adenoids may also be taken out at this time. A special tool with an electrical current, or clamps and ties will be used to stop bleeding. Stitches may also be used to close some cuts. You will be taken to a recovery room. The length of the procedure will depend on the amount of work you have. The usual length of stay is 1 day. This is to make sure you can swallow. If you have any problems, you may need to stay longer. In other cases, you may not have to stay overnight. It may take a few days before you are comfortable enough to return to your normal diet or return to work. Uvulopalatopharyngoplasty (UP 3). Ear, Nose, and Throat Center of Utah website. Available at: https://www.entcenterutah.com/adult-care/surgery/pdfs/Post-Operative-Instructions/Uvulopalatopharyngoplasty-post-op-instructions.pdf. Accessed August 13, 2018. Surgery for sleep apnea. American Sleep Apnea Association website. Available at: https://www.sleepapnea.org/treat/sleep-apnea-treatment-options/sleep-apnea-surgery. Accessed August 13, 2018. Khan A, Ramar K, Maddirala S, Friedman O, Pallanch JF, Olson EJ. Uvulopalatopharyngoplasty in the management of obstructive sleep apnea: The Mayo Clinic experience. Mayo Clin Proc. 2009;84(9):795-800.